Galloway Lodge Preserves in Scotland have been producing superb quality, award-winning, jams and preserves for more than 40 years. Incorporating the best of locally grown ingredients into their products and using time-honored, traditional cooking methods. They even have their own cafes and weekly pop-up restaurant! So, if you’re planning a trip to Scotland make space on your itinerary for a unmissable experience! Here for your delectation are my thoughts on a selection from their extensive range. The best pickle of this variety that I’ve tasted. Unlike supermarket pickle brands, the Poacher’s Pickle does not have an overpowering sharp vinaigrette flavor. In fact I wouldn’t immediately think that the Poacher’s Pickle had vinegar in it because of the medley of other flavors. Ingredients: Tomatoes, sugar, malt vinegar, raisins, apple, onion, water, salt, spices. The Original Galloway Mustard has an exceptionally pleasant fragrance and is one of the first things you notice upon opening the jar, and the fragrance is present in the taste, assumedly due to the type of mustard and blend of spices. The Original Galloway Mustard is a wholegrain mustard, which in my opinion is the best kind and, interestingly, Galloway Lodge Preserves have their own mustard mill! The Original Galloway Mustard has a very crisp and refreshing quality quite unlike any other mustard I’ve ever tasted, so distinct in fact that I would instantly recognize it if I tasted it at a restaurant or delicatessen. Ingredients: Water, mustard seed, malt vinegar, honey, sugar, salt, spices. We at Previous Magazine are really quite into all things spicy (our simple chilli and garlic edamame recipe is ever popular), and although a lot of people get a little scared of anything containing chilli, we feel that it is something that anybody would enjoy having just the right amount of kick. Galloway Lodge Preserves have dedicated this jam to their late donkey Sammy who also had a bit of a kick, which put a smile on my face as I love donkeys. The Chilli Jam has an interesting quality of being sweet yet at the same time not sweet, it isn’t quite a savory jam yet it isn’t quite a sweet jam, it lays somewhere in-between, it would go so well with so many different things. 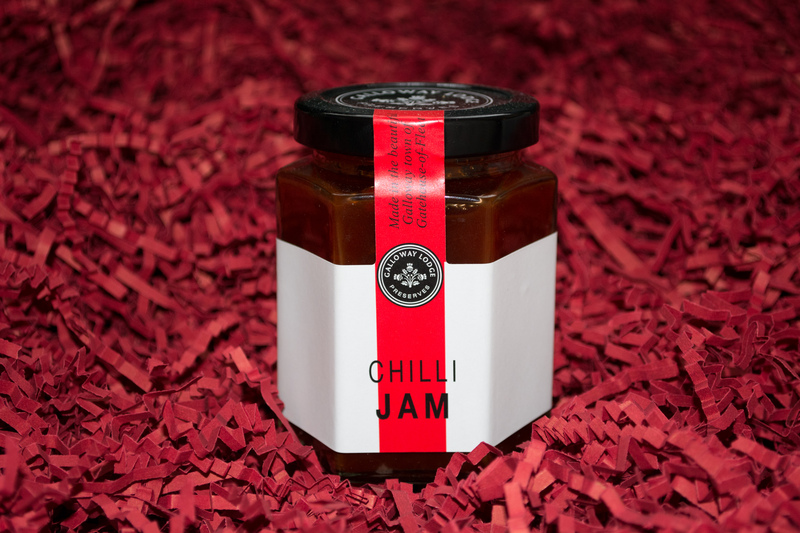 The Chilli Jam has a slightly less viscous consistency similar to that of a sauce, ideal for dipping things in but also fantastic for spreading on sandwiches and crackers. The Chilli Jam makes an ideal accompaniment to cold meats from your local delicatessen, even nachos if you’re feeling a little more casual, anything really. A very unusual and very versatile jam. Ingredients: Sugar (raw cane), sugar (soft brown), chillies, red peppers, white wine vinegar, onion, garlic purée, concentrated lemon juice, preservative (sulphur dioxide), salt. This is how I imagine the finest homemade strawberry jam to taste; hand cooked in small pans over an open flame and not synthetic in the slightest, it actually tastes of real strawberries with a fruity, cool and refreshing aftertaste. 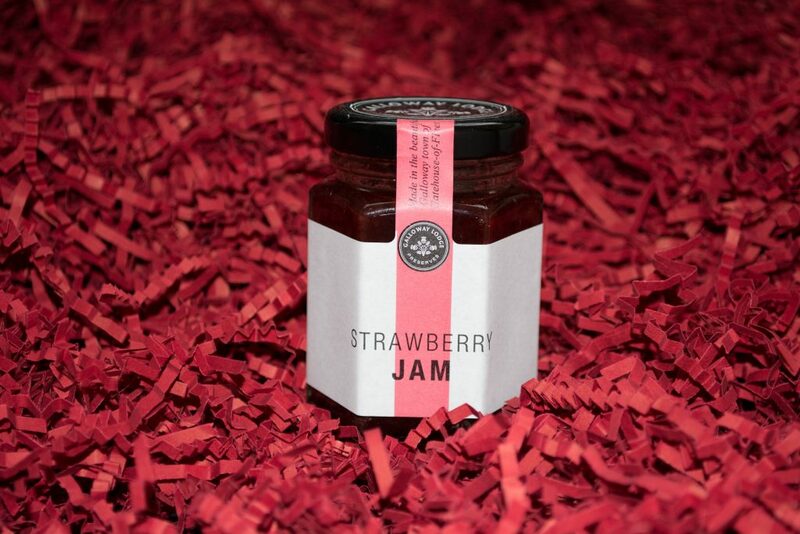 Unlike most supermarket strawberry jams, the Galloway Lodge Preserves Strawberry Jam, the first taste in your mouth is strawberries rather than just “sweet” like with a lot of strawberry jams out there. Ingredients: Sugar, strawberries, lemon concentrate, fruit pectin. Unlike the majority of supermarket brand marmalade, the Galloway Lodge Marmalade is more of a bitter flavor than a sweet one, yet an extremely pleasant bitter flavor, now I’ve tasted this, I would not want marmalade any other way. Without a doubt the best marmalade I’ve tasted with an incredible lingering aftertaste. The ingredients are simply oranges, sugar and pectin, yet this simple trio of ingredients merge to create a sum greater than its parts. The Fine Cut Peel Orange Marmalade is absolutely beautiful. The label of the jar states that the marmalade is cooked by hand in small pans over an open flame which allows the fruit to caramelize with the sugar and produce a rich home-made taste. The Galloway Lodge Preserves have a very adult flavor, which are complex, diverse and absolutely delicious. I had a preconception of what these preserves would taste like, but those preconceptions were blown away, it is delightful to be proven wrong in a positive way for a change about food products, I think it is fantastic that in 2014 they are still businesses making their own food products by hand in the UK. As with the majority of food, you get what you pay for, although you pay a slight premium, you are getting handmade products made with premium ingredients in professional packaging that are honestly some of the most mouth-watering things we have ever tasted. We wholeheartedly recommend Galloway Lodge Preserves and we feel that they make brilliant gifts to give to friends and family regardless of the time of year, especially with the lovely red corrugated packaging, Galloway Lodge Preserves have got a very charming yet high-end aesthetic to the packaging which mirrors their understanding of minimalism, in terms of ingredients, for a big impact. Whilst perhaps not the easiest thing to find this side of the Scottish border, the number of English stockists is steadily growing. Galloway Lodge Preserves are also available to purchase online direct from Galloway Lodge Preserves. I will definitely be visiting their pop-up restaurant when I’m next in Scotland as I am so very impressed.